Sunday January 07, 1945. The different parts of the regiment took their departure positions before the daybreak. Few minutes before 08h00 the advance command post composed by Colonel Maurice Stubbs, Major Thomas Lee (S-3) Captain Fred Guerry (S-2), a man called Cianci  and headquarter staff went to Monti . Map 1 : this map shows the theoretical order of operations and position of the different components of the 193rd Glider Infantry Regiment on January 07, 1945 according with the scheme realized in the accumulated records of the unit (above). 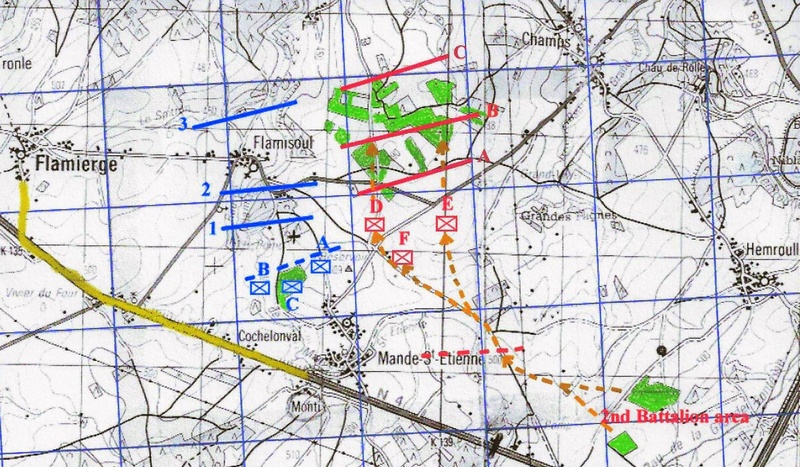 Blue and red lines represent the phase line, respectively for the First and Second Battalion. ----- are the departure lines. Dead man’s ridge is in yellow. It seems that these scheme are wrong at least for the Second Battalion (TFH). In the first Battalion area, men of B and A Companies crossed the village of Mande-Saint-Etienne toward C Company, which was located in the front line. It was B Company that opened the way. The two units joined the right part of the wood located northwest of Mande-Saint-Etienne (map 1). Departure line was located on the north part of the wooded area. The heavy machine gun platoon took place at that position. Mortar platoon took place in the north part of the village. 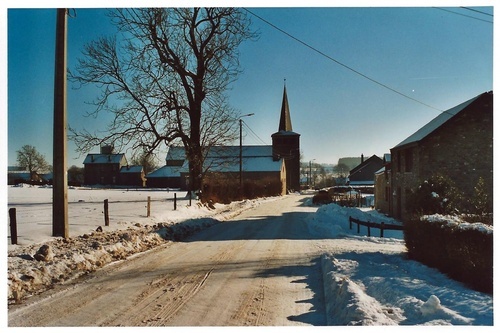 This is a current view of the village of Mande-Saint-Etienne (the photo has been realized on January 5, 2002) (TFH). In the Second Battalion area, the men of Company E were wake up during the night. 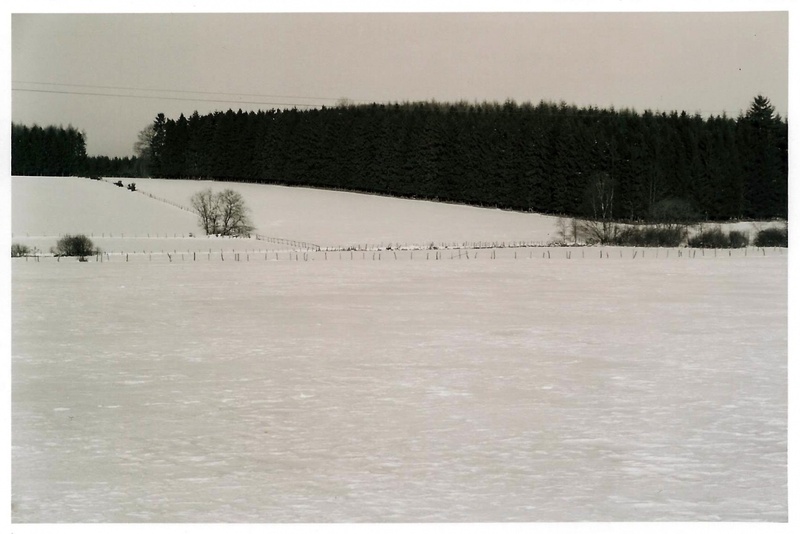 They carried a minimum of supply for moving fast in the snow and joined their departure line located just west of the area called « Fond de Laval » (there is no English translation of this place) in the north of Mande-Saint-Etienne. They moved by the left to avoid to cross the positions of the 327th Glider Infantry Regiment, 101st Airborne Division that were located front of them, just in the front line. There was a heavy machine gun section in support of each company (probably the heavy machine gun platoon of each company). The mortar platoon took position in the slope before the Mande-Saint-Etienne to Champs road to be ready to open fire between 08h00 and 08h15 in support of the attack. Nestor Donald who was mortar platoon member has confirms this fact (each company had three platoons with 81 mm mortars, Nestor was member of one of this platoon). 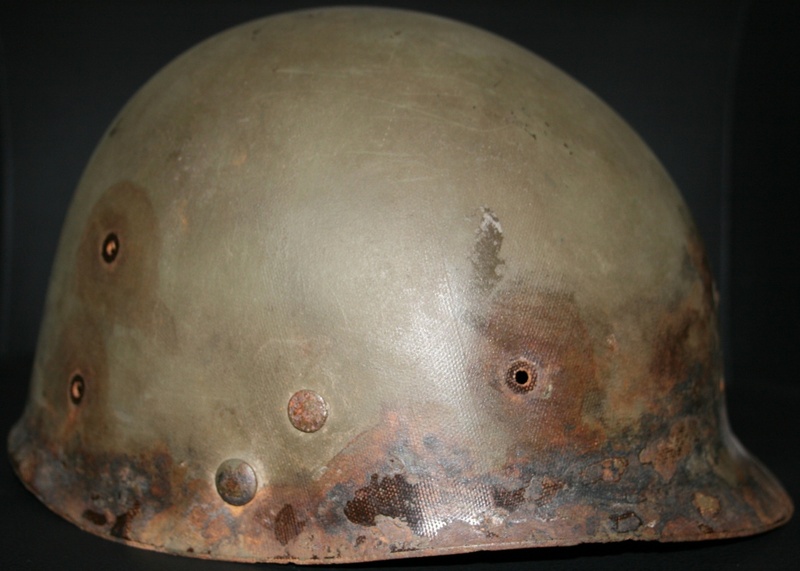 I have found this M1C helmet liner there is few years ago in the area. 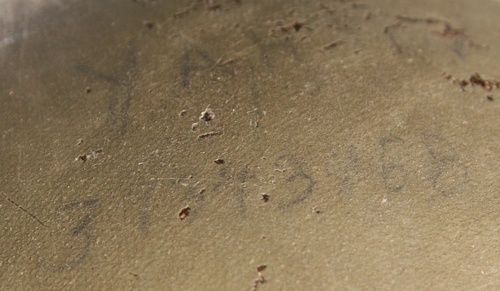 It was in very poor condition but I was very surprise to find a partial name and an Army Serial Number write down on the top : YAH...N - 39343468. 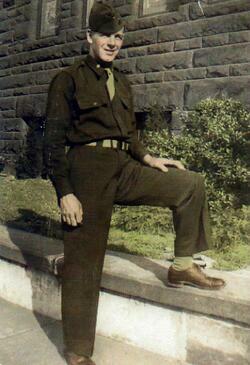 Rapidly I identified the soldier : Gilbert Yahtin (1925) from Multnomah, Oregon. 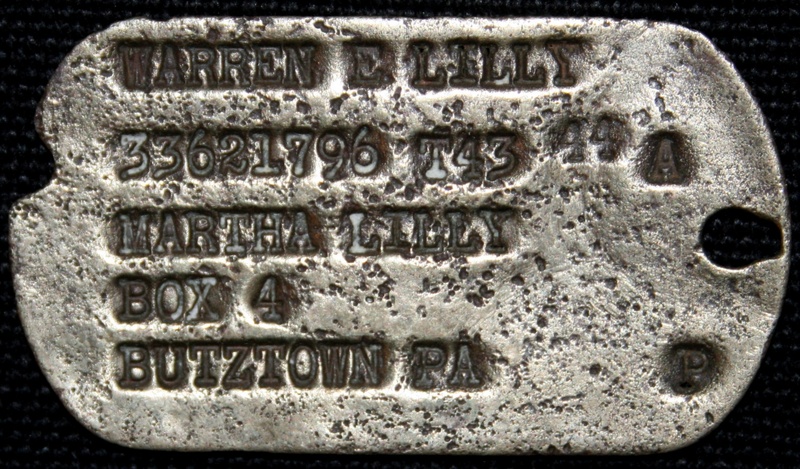 He was member of the 327th GIR - 101st AB Division and was KIA at the age of 19 during the Battle of Bastogne (TFH collection). “Leaving our overcoats, galoshes, and packs behind, we moved out very early to a place south of Flamisoul  and toward Mande-Saint-Etienne. At 08h00 we fanned out crossed a creek and proceeded up a snow covered open field up a gentle slope. It was about 200 yards to the crest. There was a farm house near the crest of the hill on the right side of the open field. There was wood corded up behind the house. Being a spotter for the mortars, I moved out with the riflemen through the knee deep snow. There had been no pre attack firing by either side. They did not see us coming because of the fog. The weather stayed awful like the previous day. Snow squalls whip the open country and temperature stayed beyond 22°F. The visibility stayed bad during the most part of the day. Donald Canfield (Co E) remembers there was bad visibility. It was not possible to see far than twenty to forty meters in plain and two hundred and fifty to three hundred meters on higher grounds. The snow bed was on an average of twenty centimeters. This photo was not realised in Mande-Saint-Etienne on January 7th, 1945 but in Krinkelt (north of the Bulge) on December 13, 1944 (TFH - Signal Corps 197337 - S). The scene is however curiousely similar to the one of January 7, 1945 early morning in the Mande-Saint-Etienne's plain ! The attack started at the schedule hour just after an artillery fire. It seems that the mortars of the First Battalion fired white phosphorus shells at 08h10. The mortar gunners were not able to adjust their fire but the shells fell just in the German positions killing ten to twelve German soldiers. There bodies were found badly burn after the battle. In the First Battalion sector Company A and B attacked while Company C was in reserve. The two companies were directly hit by an intensive artillery, mortar and light weapons fire. They couldn’t be help by the tanks of the 707th Armored Battalion that stayed under cover in Monti (probably Mande-Saint-Etienne). Company A on the right and Company B on the left side stand literally rooted to the spot. They couldn’t reach the first phase line. The German soldiers who fought in front of them were member of 3rd, 10th and 11th Company, 104th Regiment of the 15th Werhmacht Grenadier Division. They were well-armed and fit out with new assault gun MP44. In the Second Battalion area Company D and E reached their departure line before 08h15. Company F was in battalion reserve. Mortars fired a total of forty to fifty shells on the German positions. 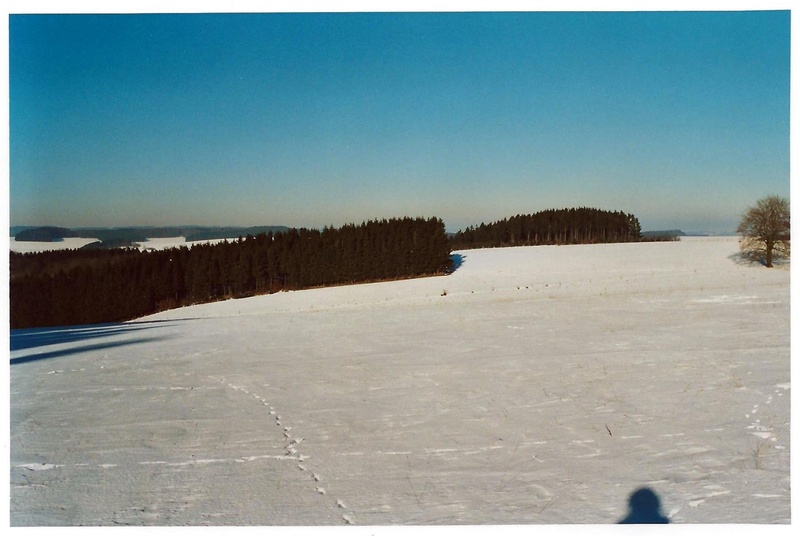 This is a (hand made) panoramic view (with photos realized on January 5, 2002) of the Second Battalion objective (I was approximately located in coordinates US 507608). 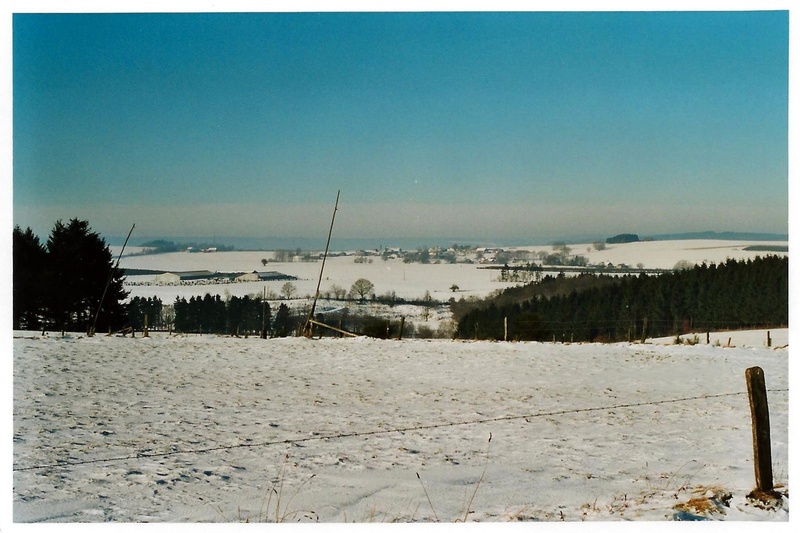 On the right, the direction of Champs (this right flank was held by the 327th Glider Infantry Regiment, 101st Airborne Division (code name Keepsake); on the left, the direction of Mande-Saint-Etienne and Flamisoul (objective of the first Battalion) in the direction of the car. we see the objective of E company on the right of the car. It is easy to understand GI’s had not protection at this place when German artillery fire fell on them few minutes after the start of the attack (TFH). 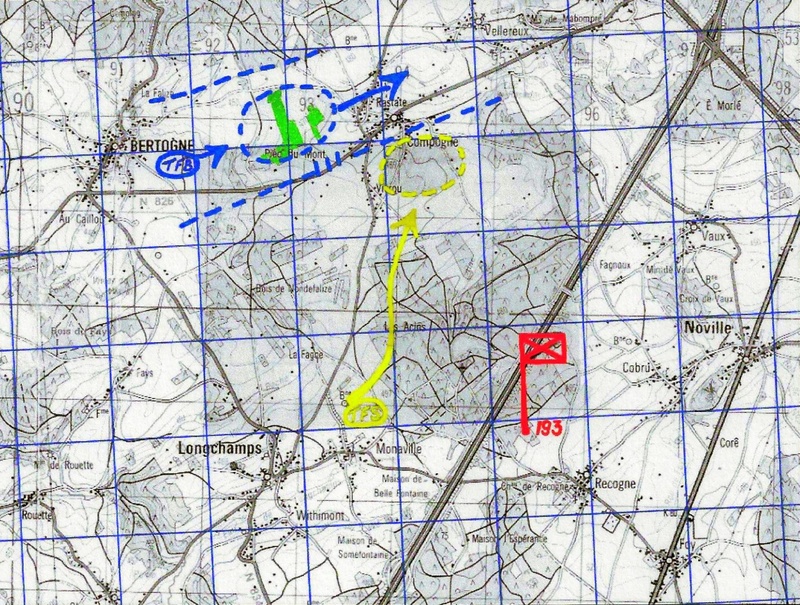 Donald Canfield affirms Company D opened the attack at 08h10 following five minutes later by Company E. The initial advance was easy because they were cover by the Mande-Saint-Etienne to Champs road that overhang the area. 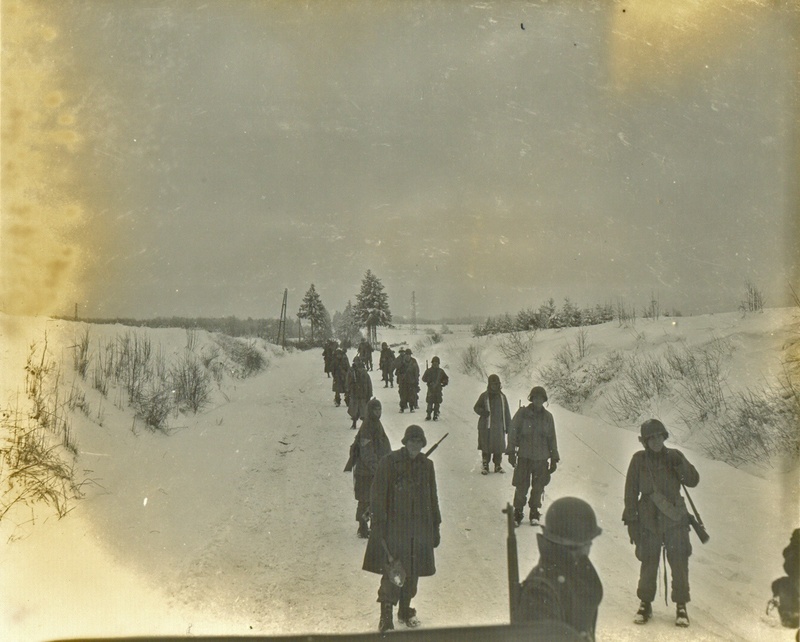 It was hard to walk in the snow but advance became easier and faster for the men of Company D when they took the road (approximately on positions 503607) although the road was full of mines. It seems that Company E advanced toward their objective across the fields south of the road (see map 1). When the men of Company D arrived on the road and crossed it an intensive artillery and mortar fire sweep down on them. At that time they were in an open field approximately two hundred meters before the aim. This area is located approximately hundred meters far from the crossroad between Mande-Saint-Etienne, Flamisoul and Champs. At this place it was impossible for the men to find any cover. Bartley Hagerman from Company D and his fellow gunner on the sixty mm mortar fired three rounds on a machine gun in tip of woods (in US coordinates 506613). The three rounds fell on objective and destroyed the German gun (later they find twisted gun and two dead Germans). It was at that time the first men were killed. Nestor Donald (Co E) remembers a shell exploded near his position. The Private First Class Charles Leeper was killed and Thomas Calvert was wound on the shoulder by a piece of shrapnel. By miracle Nestor was not wound. “Once the Germans saw us, both sides opened up with all they had. Sergeant Kreuzer  and I was behind the woodpile directing mortar fire. I had a lot of trouble keeping the phone lines as shells kept cutting it. One shell landed so close it tore the back of my pants. There were dead scattered over the field. To the explosions crash that tore up the frozen ground was rapidly added Nazis machine guns frightful sound that uncertainty swept the plain. Donald Canfield remembers well the gunners were dazzle by the fog. They couldn’t so adjusted their fire and shouted haphazardly in the US supposed positions. When he passed the crossroad the Private First Class Allen Myers (Co E) who was the radio and runner of the 2nd Lieutenant Telesca saw the Sergeant Charles Thomas who was wounded. He had received three bullets on his legs. In spite of a high-density machinegun fire he kept the victim and putted him on the other side of the crossroad just behind rocks, which don’t exist now. Directly Medics gave him first care. The two companies of the First Battalion reached the first phase line at 08h45. At that time they were approximately at two hundred and seventy-five meters of their departure line (coordinates 495-607 for Company A and 492-607 for Company B). Those positions correspond to a wood located on foot of a slight sloop for Company A and the top of a hill for Company B. At those positions, the men of the two companies can saw “Dead man valley” on there left. These photos realized on January 5, 2002 show well the objectives of the first Battalion. The woods are still present. Company A was on the left however Company B was in front of the camera (TFH). Around 09h15 the whole of the two battalions had pass beyond the first phase line but the advance was very slow. At 09h19 Company D reached its first phase line although Company E was in trouble. It reached nevertheless its first aim. In the area of Company A, the men continued their advance and leaved the wood. They climbed the slope and arrived on the top of the hill. They find on the other side of the hill another wooded area at approximately seventy meters. When the first men arrived at twenty meters of the edge, hell fell on them. Company B was the most hardly hit. The GI’s tried to run across the open snowfield to escape. Several men assaulted the German positions. Four to six tanks of the 707th Tank Battalion came in support but the 88 mm German guns kept them at a respectful distance. It was impossible to localize the guns position and the tanks stayed so under cover behind Company B. Since 09h32 was reported the capture of the first ten prisoners in this sector. In the same time and on the same position, more on the left we see a current view of “Dead man valley”. The village is Flamierge and the horizon line on the left was “Dead man ridge” (TFH). At the same time the Second Battalion was locked on the first phase line by machine gun fires. An artillery fire was command for trying to neutralize the German position and the advance started again. The second phase line was reached around 09h59. The men of Company A captured four new prisoners. At 10h08 the fighting in the sector of the First Battalion were very hard and Company A had lost nearly one platoon, all the squad leaders of Company A except one and two officer were killed or wounded and three officers of Company B were reported out of fighting. 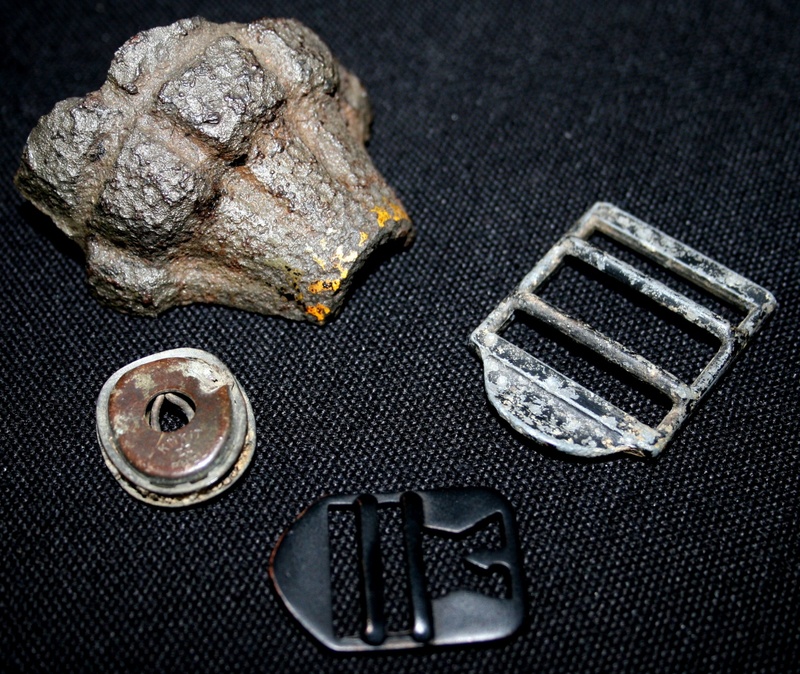 Relics found years ago on the first phase line of First Battalion (TFH collection). Company E thought having reached a position located ninety-five meters before its second phase line. The advance was increasingly more difficult under the mortar and machine gun fires. The visibility was so poor it was impossible to localize the origin of the fire. Captain Charles E Juckes called Lieutenant Colonel Balish for giving him information about his situation. The lost were heavy. Approximately one platoon was out of combat . He asked some help but he was unable to localize precisely his position. The only think he was sure was he was with his men in the edge of a woods. Donald Canfield remembers well the German bullets knocked against the fir trees just above his head. In fact, in a total confusion because of fog and artillery fire, the Company E had turned on its right. When the men reached the edge of the wood they thought they arrived on their objective. In fact they arrived in Company D area and they opened fire on their comrades. A sergeant of Company D was killed and another man was badly wound on his head. 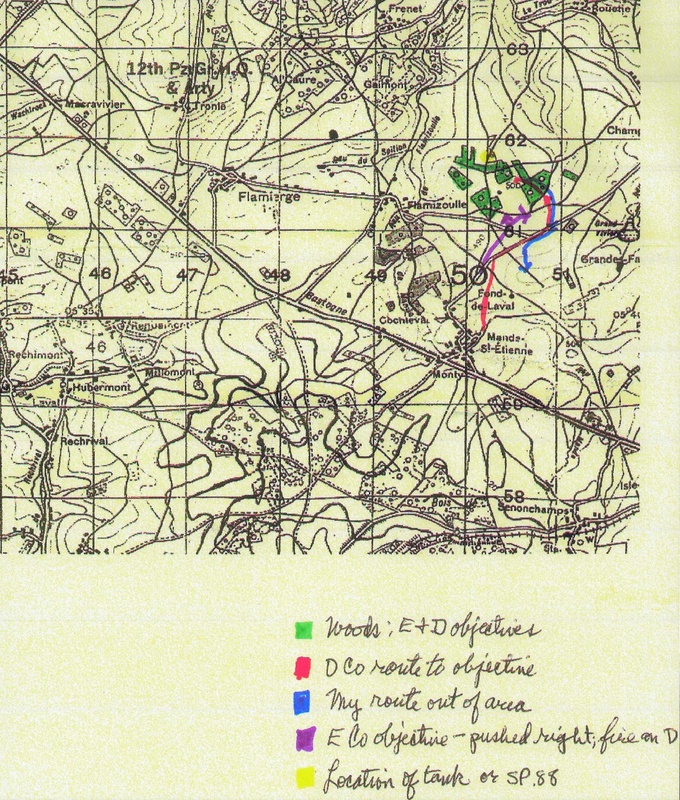 Company F was on the rear of D company and so the whole Second Battalion was finally located in the same wood (Map 2). Objective of Company D. It is at that place Company E arrived and open fire by error on their friends (TFH). 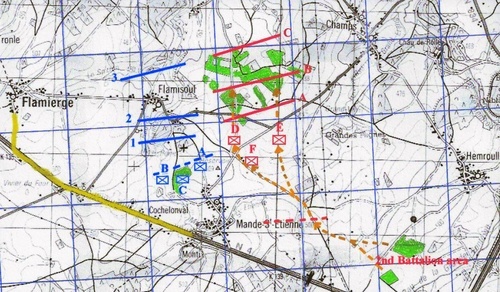 Around 10h20 Company A was still in its first phase line when Company B took hold of its second aim at 10h50. Unfortunately at 11h15 new 88 mm gun fires stopped again advance of the First Battalion. 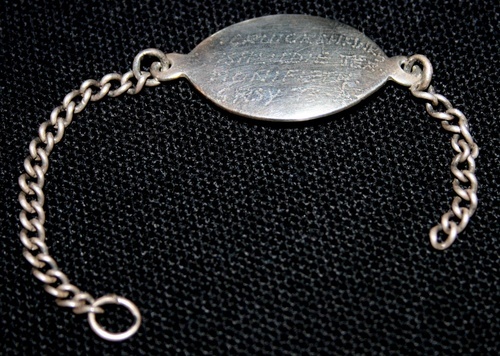 One platoon of Company C commanded by Lieutenant Walter B Black tried to join Company B. It couldn’t cross “Dead man valley”. Company C took the place of Company A badly mauled. This last one started drawing off at 11h20. It returned in a defensive position near its first phase line. Few minutes later, at 11h42 Company B received a light counter offensive just at the time where Flamierge fell in the hands of the 513th PIR. Map 2 : Bart Hagerman (Co D) had sending me this map in a mail dating from April 2002. He has inscribe on it the way he followed on January 7, 1945 according with his own memory, information from James Black, and Jerry Stuhrman. It looks like very different from the order of battle found in the regimental accumulated records (see scheme p25). It seem that Company E was on the left and Company D on the right. Curiously, there are only few signs of fighting in the woods where Co D and E stroke themselves although there are still a lot of signs of fighting in the above wood (objective of Co E) (with courtesy of B.Hagerman). At 12h30, one platoon of Company C commanded by Lieutenant Franklin R Morris went ahead to protect the left flank of Company B. 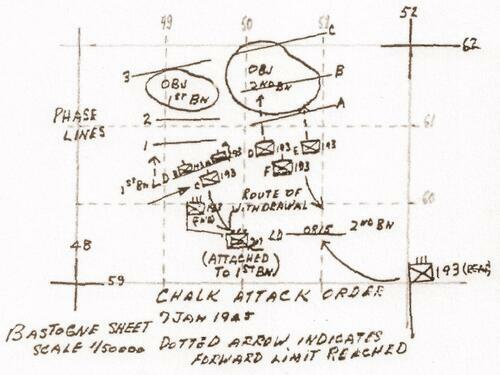 At 12h40, in great confusion, the men of the 513th Parachute Infantry Regiment opened fire on Company B . Immediately all was intended to stopped these fires but before the first radio messages arrive in the 513th Parachute Infantry Regiment, a man of Company B, the Private First Class Paul Bogozelski started to run a thirty meters run under fire to explain the tragic error to his fellows of 513th Parachute Infantry Regiment. At 13h30 Company E was always in trouble. Donald Canfield tells captain Juckes received the order to stay on his position. Company F must outflanked Juckes’ company. Lieutenant Colonel Balish modified so his first plan but he hoped still reached his initial objective with company D and F .
Around 14h10 an armored support was sending to the Second Battalion. At 14h35 Company F received the order for outflanking Company E and taking its position. Company E was badly touched and became battalion reserve. The fights waked when the GI’s entered in the woods. At that time the Germans were more disposed to surrender. Donald Canfield remembers some prisoners cried « Polski, Polski ». It means that men were Polish people. It is possible because of the great heterogeneity of the German army but I haven’t found other information about this fact. The two companies reached the north edge of the woods when they identified a German tank (or self propelled gun) in the field on the east border of the woods along the road that leads to Givry (US coordinates 502617). It was protected by a machine gun located in woods on the other side of the field. The tank immediately opened fire but it was impossible for the bazooka teams to reach the target because of the machine gun. Artillery tried to neutralize the tank without result. It responded with new fires. Around 14h30 Lieutenant Colonel Balish came on the first line near Company D and F. At that moment it fell on them a terrible artillery fire. It seemed to come from the north and was so accurate that the tank was suspected to control the fire. The weather became more lenient and the visibility was now better. The tank was perfectly seen, it was alone in this snowfield. In this condition it seemed impossible for Lieutenant Colonel Balish to march forward. Hour after hour, Colonel Stubbs, the regimental commander, saw the disaster. No unit could reach its aim and there were heavy losses. In those conditions he gave the withdrawal order to the First Battalion at 14h50. The movement started at 15h00. At the end of the withdrawal, the battalion was again on its previous morning positions, before the attack. Companies A and C stayed on the first line however Company B was placed in reserve in Mande-Saint-Etienne. At 15h30 the General Brigadier Whitelaw informed his subordinates that general Miley had decided a general withdrawal on the initial positions. At 15h35 Colonel Stubbs leaved the advance command post for the rear headquarter to prepare the general withdrawal plan. Around 16h00, Lieutenant Colonel Balish understood he should not capture his objective, and holding his position was extremely expensive in human life. So he returned on his forward command post located in a barn along the road of Mande-Saint-Etienne to Champs (in US coordinates 504605) to report his situation and prepare the withdrawal. Donald Canfield reports that at the same time, the men of the 101st Airborne reported two enemies companies making movement from Givry toward the woods held by the Second Battalion. At 16h20 the First Battalion had withdrawn to its previous position and the Second Battalion started its maneuver under an intensive fire. At that moment numerous German soldiers coming from the woods located on the north of his position attacked his battalion. They were temporarily stopped by friend artillery fire but they rapidly reached the right flank of the battalion on the edge of the woods. At this moment his company (Co E) was still in reserve and was so the first one to leave the woods. Company D was on the left flank far from the German attack and followed Company E in its withdrawal. “On the left, a soldier wearing a snow cape emerged arms waving franticly. A shot was fired but luckily the round went only thru the sheet. It was a member of the I & R who had been lost on patrol for a couple of days. Tanks were heard in the next defile moving toward us, Lieutenant Aytes was trying to locate a bazooka team. They appeared as the lead tank approached. It was one of ours heading to the rear. A medical jeep passed bringing back wounded. Things began to look grim. The mortars moved back across the creek to the original position behind a small hillock. There were pine trees at its crest and on the forward slope. The mortars were to stay to cover the retreat of the riflemen. F Company had been in reserve and was given the job of covering the retreat. The mortars left in a hurry leaving the carts behind and carrying the guns and ammo back to the position we left in the morning but now we were without overcoats, blankets or kitchen. But many dead on both sides were left behind. The AT group were never able to dig in because of the frozen ground. The Division Engineers unavailable to blast positions as they were occupied in a defensive position. From the rumor mill we heard the decision to save the mortars was because the artillery and AT was unable to support the forward progress of the Regiment. The Germans deduced that we would return to our original position so let go a tremendous barrage walking it down the reverse slope toward the mortars emplacements. Scarring the hell out of us but no casualties. Pello was warning us that things weren’t looking very favorable when a couple silhouettes rose out of the snow on the right. In long overcoats they struggled down the hill. They were two weary members of the 1st Battalion happy to be in their own lines once more. Lieutenant Joseph B Smith from Company F volunteered to legged behind and fight to protect the withdrawal of his buddies. Under a heavy fire Smith lost five men, including his radio operator, which obliged him to assume himself the radio operations. The company withdrew initially to the south but Lieutenant Colonel Balish ordered to turn to southeast. Without knowing it, they avoided the direct shoot of a little enemy group entrenched in the southwest part of the wood. However the German soldiers opened fire. Private Bailey of the communication section with another Private of the anti-tank Company turned the enemy and opened fire with a bazooka destroying a machine gun. German survivors escaped. Smith and his men finally managed to leave the woods following Company D at approximately hundred and eighty-five meters. In his withdrawal he crossed the road of Lieutenant Arne C Christiansen from Company E who commanded a group of a few men of his company who couldn’t follow their unit during the withdrawal. They assumed so the protection of Company F.
During the withdrawal Don Canfield tried to join his squad when he arrived out of the woods and saw the German tank on his left. He thought his last moment had come and rapidly ran toward the edge of the woods where he had seen another GI who had fallen on the ground. When he arrived near this soldier he tried to speak with him but he understood rapidly this poor young man was dead. This moment deeply marked him and since than he has keep these facts in his memory like one of the most terrible memory of his life. When he lifted his head he saw on the right his buddies running toward the rear position. At this moment a violent artillery fire hit the area. He just had the time to jump on the ground before being badly shaken. The shock was so hard he developed an intensive trembling and was unable to take a cigarette in his pocket. After that he took advantage of a lull to run to the withdrawal group. It was approximately 16h45 when Lieutenant Christiansen leaved the woods with his men who carried the wounded friends. They were the last men to leave the position when the night started to fall on the battlefield. When night had fallen, the battalion was assembled around the forward command post and sent to its previous positions. The fifty prisoners captured were members of the 104th and 108th German Armored Regiment. Between two hundred and four hundred men of their units had arrived on the first line the previous night. - One hundred and sixty-seven men of the 17th Airborne Division were killed in action. - In the 193rd Glider Infantry Regiment, four officers and fifty-eight men were killed (see table I). - In Company E, one officer and eleven men were dead. There were also a lot of wounded men but it is impossible to know the exact number. Private First Class Irvin Shore remembers very well having loose a great part of his platoon during this day. At the end of the day Lieutenant Colonel Balish said about his men: « At the end of the day they were not only tired but also knocked down and they seemed dazed. ». The officer of the Company E who was killed this day is the 2nd Lieutenant Leslie H Telesca. He died because of the explosion of a phosphorous hand grenade hooked on his harness. 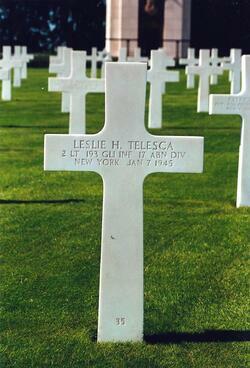 Second Lieutenant Leslie H Telesca was very appreciated by his men. We see on the left the young officer (probably on leave between 1942 and 1944). He was killed in action on January 07, 1945 and is now buried at Hamm US Cemetery near Luxembourg City, Great Duchy of Luxembourg (unpublished photo with courtesy of Telesca-Robinson family). Table I: listing of the 193rd Regiment men died on January 07, 1945. 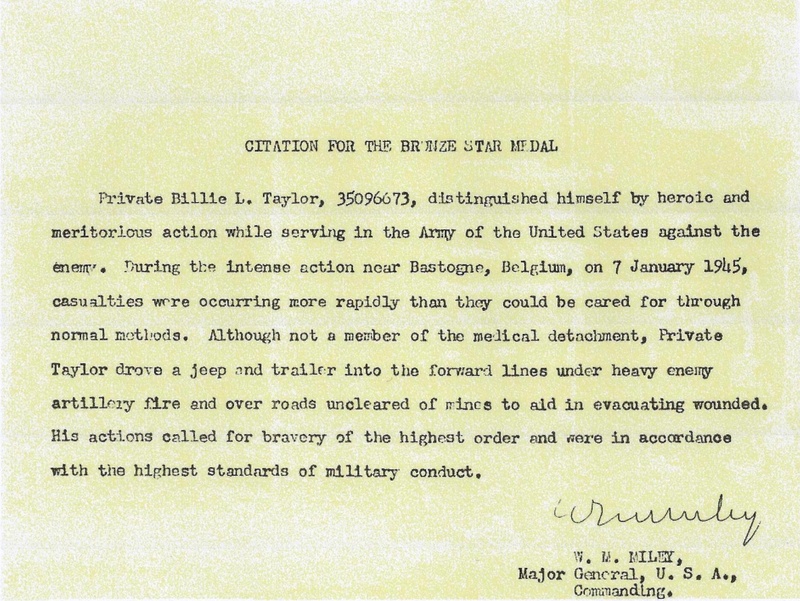 Souvenirs of 193rd Glider Infantry Regiment … Here above, the Bronze Star certificate of Billie L Taylor (Company HQII) (with courtesy of Billie Taylor). James Zitch (Company E) who was badly burned by the explosion of a cook stove in the vicinity of Bastogne (with courtesy of Doris Zitch). The regiment stayed on its position and prepared new attack plans. The men of Company HQII dug in expecting a tank attack. They got their equipment back along with the kitchen and the first mail since leaving England. This photo was realized on the National 4 road and shows members of the 17th Airborne Division (the exact unit is not know but may be 513th PIR). Bastogne is located on the left side of the horizon line and the village of Mande-Saint-Etienne on the left side of the fir trees. We see well the difficult climatic conditions in which those boys fought (TFH collection). About 05h00 soldiers of the First Battalion tried to infiltrate the German lines. The patrol was stopped by machine gun fire after a progression of five hundred meters. Early in the morning, between 06h00 and 07h45, artillery fires felt on Company C area. The snow felt by intermittence and temperature didn’t exceed 15°F. It was impossible to obtain an air support with such an awful weather. In the morning Lieutenant Colonel Balish was in first line to encourage his men when he suddenly saw Donald Canfield who tried to stand up resting on his rifle. He directly understood the boy was in trouble and came up to him. He said friendly « son you’re not going anywhere », and called the medics. Donald was transferred to a first aid station. When the medics cut his boots they found two black feet. So he was transferred toward a greater medical station. Just after his departure, a German shell hit the first aid station. He stayed in France for a short period and than was sent to England in a hospital near Oxford where he stayed for a few months. When he returned in the United States he was still located in a hospital in the Boston area. 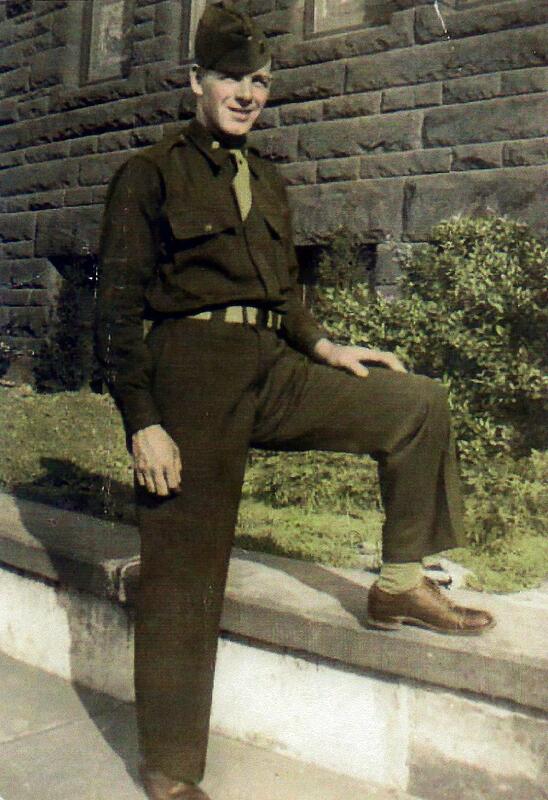 He finally moved to a rehab hospital at camp Pickett, Virginia before being discharged in August 1945. Harold Osborn (Co E) affirms approximately one half of his company was disabled after the first two days of fighting. Yet it is impossible for me to confirm this. Phillip J Rice remembers that many men went to first aid with frozen feet. Fortunately he had kept a pair of spare socks in his helmet liner and it saved there feet. Six men died on January 08 (table II). Table II: listing of the 193rd Regiment’ men died on January 08, 1945. 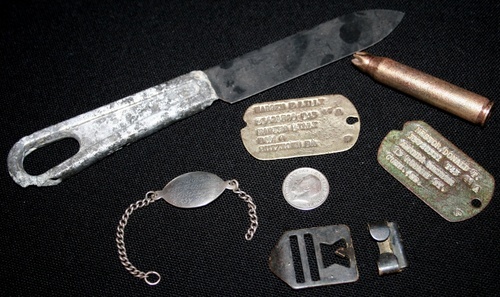 A few relics found during recent digs realized in the woods where Second Battalion was located on January 05,06,07 and 08, 1945 (TFH collection). Tuesday January 09, 1945. Regiment received order to relieve the 327th Glider Infantry Regiment, 101st Airborne Division, which held an area located between the village of Champs and the largest woods where Company E was located . Between 13h15 and 14h15 the Second Battalion moved to the right flank of the front line even though the First Battalion moved on the left flank and the Regimental Headquarter moved toward Hemroulle. It means the First Battalion moved from the vicinity of Mande-Saint-Etienne toward the Second Battalion positions and the Second Battalion moved toward woods located south of Champs. Company A from the 602nd Tank Destroyer was attached to the regiment and Captain Hart (officer of this unit) was designated commander of the anti-tank part of the regiment. Battery D and E from the 155th Anti Aircraft Battalion were also attached to the regiment. Intermittent artillery fires felt on the Second Battalion area and men located in observation posts reported German soldiers and vehicles in the village of Champs. They asked artillery intervention to neutralize there enemy movements. “More frozen feet including Lieutenant Aytes. The company now had only 2 of the original 4 heavy machine guns. In the afternoon, we moved out and circled the area of the attach 7th and relieved the 327th Glider Regiment of the 101st Division. I was on the outpost at the top of a hill with radio in place of the phone. I could see Germans off in the distance out of range. Off duty I stayed in a house in Champs . Each squad cooked their own Ten in One rations. The company fired 1200 mortar rounds per day for the next five days. At this time the mortars had target stakes all over. Firing at many targets off the same stake. They even used a flashlight for night firing. Four men passed away (see table III). Table III: listing of the 193rd Regiment’ men died on January 09, 1945. The front line didn’t change until January 12. During those days the only actions were active patrols in the enemy lines. A few German prisoners were captured. Four men died on January 10 (see table IV). Table IV: listing of the 193rd Regiment men died on January 10, 1945. 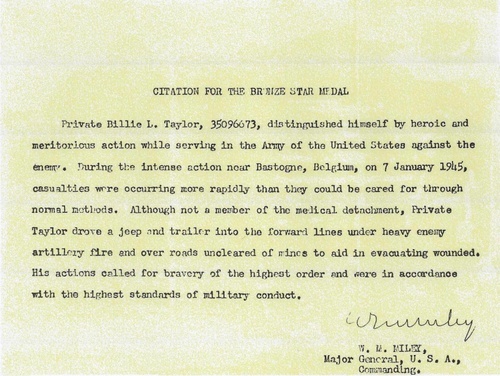 Thursday January 11, 1945. In the morning there was a dense fog and snowfalls reduced visibility to less than five hundred meters. During the afternoon the weather became better and an Air Force support was possible since 14h00. 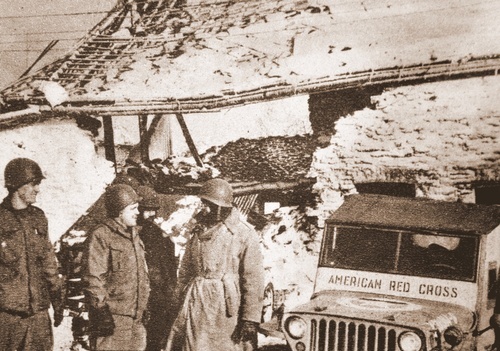 During the day, men of the HQII Company received the tail end of the Red Cross supplies. This photo extracted from "TALON with the 17th in Ardennes" shows men of the 17th AB with American Red Cross's personnel "somewhere in the Bulge" (TFH collection). 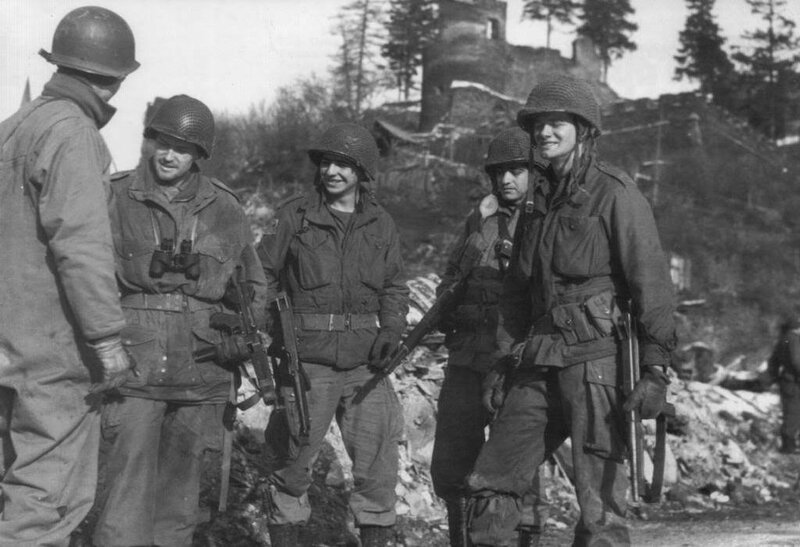 At 20h00 the First Battalion was relieved from its position by the 513th Parachute Infantry Regiment. It was placed in regimental reserve and joined a position just behind the Second Battalion, in woods located on both sides of the Hemroulle-Champs road. No man was killed on that day. Friday January 12, 1945. The weather was partially cloudy and the fog disappeared after 10h00. Temperature remained very fresh with a maximum of 30°F at 15h00 but visibility was now excellent and allied aviation boot down on German lines between 10h00 and 17h00 causing important damages. German shells hit the Second Battalion positions. Five men of the 77th Volksgrenadier Regiment were captured in this area. - Making movement toward the 507th Parachute Infantry Regiment area and follow this unit. - «Cleaning» Flamisoul, woods on the east of the village (the old objective of the Second Battalion) and maintain contact with the 513th Regiment on the left. The men of the Company HQII made a long march, dug in at twilight, then moved after dark around behind the woods where the attack of the 7th took place . Two men were killed by booby traps set in abandoned foxholes (Phillip J Rice) . Four soldiers died (see table V). Table V: listing of the 193rd Regiment men died on January 12, 1945. Saturday January 13, 1945. The attack started at 08h15 after artillery preparation. The weather was partially covered but visibility became better after 09h00. It was possible to see at three thousand and five hundred meters in the morning and at eight thousand meters in the afternoon. The temperature remained cold with minima of 18°F at 05h00 and maximal of 28°F at 14h00. The Regiment advanced according to the established plans but at 12h00, Major Green (G2) informed Colonel Stubbs his regiment was attached as part of the 11th Armored Division. At that time, men of the First Battalion were located approximately five hundred meters south of a little village called Frenet (US coordinates 489627) although men of the Second Battalion arrived in the wood they had captured a few days before (US coordinates 506615). Colonel Stubbs returned immediately toward Mande-Saint-Etienne to meet General Miley. He asked Lieutenant Colonel Schorr to convoke the battalions’ commanders. Lieutenant Colonel Schorr returned to the First Battalion around 12h30. Several minutes later, Brigadier General Whitelaw arrived in the First Battalion and ordered Lieutenant Colonel Schorr to send one officer to the crossroad called “Au Caillou”, near Bertogne  (union of Gives, Longchamps, Compogne and Bertogne roads), before sending the entire regiment. Lieutenant Colonel Schorr sent a platoon toward the crossroad and informed the executive officer of the First Battalion to make movement toward the new objective along the road Frenet, Givry, Gives, Bertogne. The Second Battalion should join the road of Givry distant from three hundred and fifty meters then follow the HQ group that transported men of the First Battalion. The different parts of the unit started the movement at 14h15. There were land mines all along the way. The regiment was in its new location at 16h00. The First Battalion was located in woods approximately one thousand meters southeast of Bertogne. The position corresponds probably at « Nondefalize woods » one thousand and five hundred meters far from Bertogne, along the left side of the Bertogne-Longchamps road (I am not sure of that). Colonel Stubbs arrived in Longchamps at 16h30 and joined the headquarters of the Combat Command A where he made report to Brigadier General Willard A Holbrook Jr, commander of the Combat Command A. He learned that his regiment was divided in two Task Forces: Task Force Stubbs and Task Force Bell. Immediately, Holbrook sent the First Battalion on a defensive position held by the 41st Reconnaissance Cavalry Squadron (coordinates 558653). This new position corresponds to the woods called « Les Acins », northeast of Monaville. The men were transported with 2½ tons trucks (GMC). At 16h45 the first ten trucks arrived and Lieutenant Colonel Ashworth embarked with his three companies. Seven other trucks embarked the other part of the battalion approximately at 18h00. They received artillery fires during the whole travel. The Second Battalion followed and took the previous position of the First Battalion. So the Regiment was located in a line of two thousand to two thousand and five hundred meters, perpendicular to the Longchamps-Compogne road, approximately at one thousand and five hundred meters far from the church of Longchamps. PJ Rice affirms the Second battalion and especially the HQII Company received German artillery fire (with white phosphorous and high explosives) during the night. I have no confirmation about this fact. Sergeant Carl E Royce (33720663- Co D). Sunday January 14, 1945 was a quiet day. There was no movement during that day. Yet, more to the north, the 507th Parachute Infantry Regiment made its junction with the 51st English Division in the town of La Roche en Ardennes, Belgium. This famous photo shows men of the 507th PIR in the city of La Roche En Ardennes (Belgium) in January 1945 (National Archives ?). “Wended our way through wooded area up the road to a point below Bertogne and attacked the town with mortars. It seemed that every house was on fire. There were a lot on incoming 88’s too. We were able to move into town. There were bodies all along both sides of the road into town. That evening assembled in woods East of Bertogne at “Nondefalize” woods. The 193 was attached to the 11th Armored to attack East with them. - 193rd Glider Infantry Regiment less Second Battalion. - 55th Armored Infantry Battalion, 11th Armored Division. - One platoon of Company C, 56th Armored Engineer Battalion, 11th Armored Division. - 22nd Tank Battalion, 11th Armored Division. - Company C of 811th Tank Destroyer Battalion less First Platoon, (attached 27 Jan 45-4 Feb 45). - Task Force Bell: I haven’t found a lot of information about this unit except that it included the Second Battalion, 193rd Glider Infantry Regiment and was commanded by Colonel Virgil Bell from the CCR, 11th Armored Division. There were a lot of snowfalls during the night. 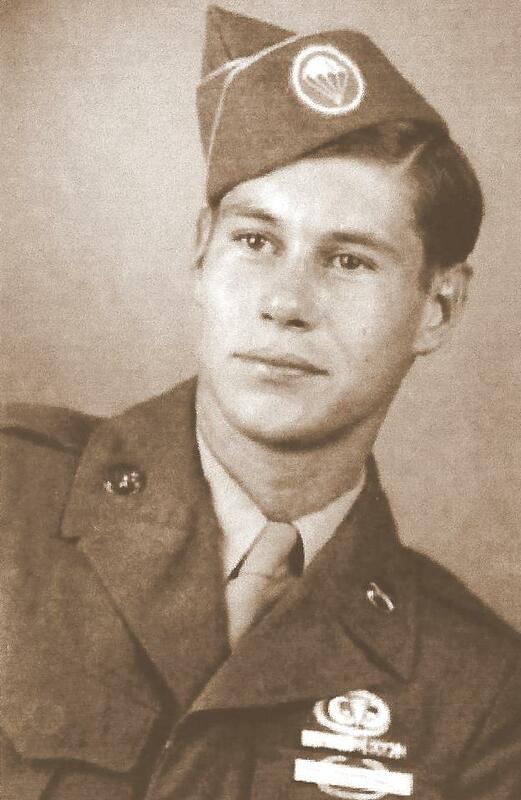 Soldier Howard S Boden (33710280) was killed. Monday January 15, 1945. The weather remained partially covered and cold. The visibility didn’t exceed one thousand and two hundred meters. Minimal temperature was 17°F at 05h00 and maximal was 28°F at 13h00. Task Force Bell was located in the vicinity of Bertogne. It should take possession of the « Pied du Mont » woods (literally Mount Foot woods in US coordinates 540670) and started its movement at 10h00 after initial artillery fire. It followed the National 826 road (Bertogne-Compogne) supported by ten tanks of the 42nd Tank Battalion. Company D was on the right, Company E on the left and Company F was in reserve and should protect the north flank of the attack. Men reached easily the east part of the aim when they were rooted on the spot by an intensive mortar fire. The tanks arrived immediately in support when suddenly 88mm guns shot them. The first shots misfired the target and exploded on the edge of the wood. The aim was finally reached at 11h24. 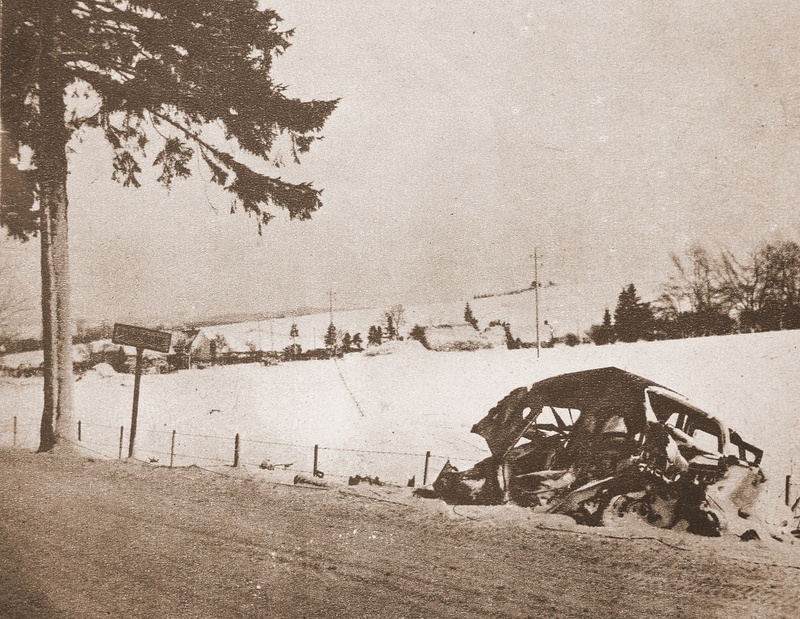 However there was no resistance in the initial advance of the Second Battalion, Lieutenant Colonel Balish lost twenty-five men because of the German artillery fire. Most of them were wounded. At 13h00, the men moved forward in direction of Compogne. The village was liberated approximately at 16h00 and two hundred prisoners were captured. At 17h00, Lieutenant Colonel Balish received order to place his battalion in a defensive position on high grounds around the village to control the road east of Rastate and Compogne . 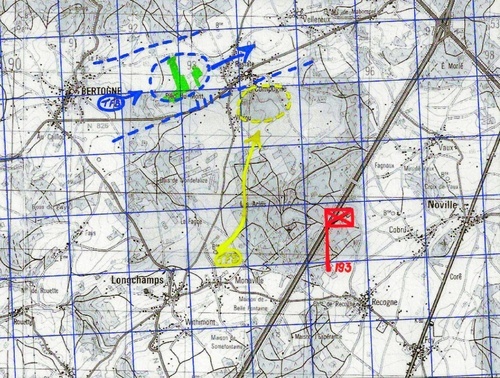 Map 5: this map shows locations and theoretical objectives of Task Force Bell (in blue) and Task Force Stubbs (in yellow) according to the scheme found in the accumulated records of the regiment. It is probably also partially wrong. Headquarters of the 193rd Glider Infantry Regiment is pointed out in red (TFH collection). “In the morning, Task Force Bell tanks’ coming up the road out of a ravine meets 2nd Battalion about the middle of the village. Tanks and Infantry converge and move out heading for Compogne. The tanks were having d difficult time trying to turn because of the ice and snow. A young girl was photographing the scene from her porch with a box camera. As the riflemen entered the woods “Pied du Mont” the tanks formed a crescent and gave covering fire. When it came time to move forward, Herrmann discarded his overcoat, it was wet and heavy, he regretted it later. Captain Barrett harried us through a firebreak in the woods and set up and fired. Immediately we received counter firing dammed accurate. The section on the right was hit. J. Smuskiewcz and J. Whitman were wounded. The 88’s were landing all around. At that moment there had been an argument over who stole the peanuts from the mess truck. It was forgotten as Marczyk and Snow took off for a large dug out we had passed in the woods. Herrmann slipped and fell but was off and overran the dugout but his buddies called out or he would have soon been back at Bertogne. After the shelling ceased, they found that they were in Captain Barrett’s CP and were soon ordered out in no uncertain terms. Sergeant Mayer was carried back to Bertogne and Snow was one of the litter bearers. They had to walk back to the unit whereas the next day the Sergeant is brought back in an ambulance. The bearers were not happy about that. The machine gun platoon was hit very hard that day and Sergeant Moeller was one of the eight casualties. Krause was also wounded. At night we moved down into Compogne. The buildings were on fire and the enemy was still shelling. A chow line was set up self-service and no one tarried getting his evening meal. Frozen feet and diarrhea was also taking their toll on the company. The squads stayed in barns or building that night with the tankers nearby. In Task Force Stubbs area, Lieutenant Colonel Ashworth sent a strong patrol toward the woods located northeast of his position  to test German lines in the north part of the woods. With this maneuver he wanted to know if it was possible to cross the woods to reach his aim. After forty-five minutes, the patrol arrived at mid-travel easily. So it sent a message to Lieutenant Colonel Ashworth who ordered the First Battalion to start its movement. 55th Armored Infantry Battalion was in support on the left and followed the First Battalion toward the woods “Les Assins”. 22nd Armored Battalion was in armored support of the above units. Advance was very slow and slackened by mines and deep snow. The regimental headquarter moved to a new location in the woods « Les Acins », hundred and fifty meters south of « Fazône » pond (US coordinates 557646). In the afternoon the sky cleared and Air Force came in support. At 13h45 the First Battalion met a more important resistance. It became very strong at 15h15. 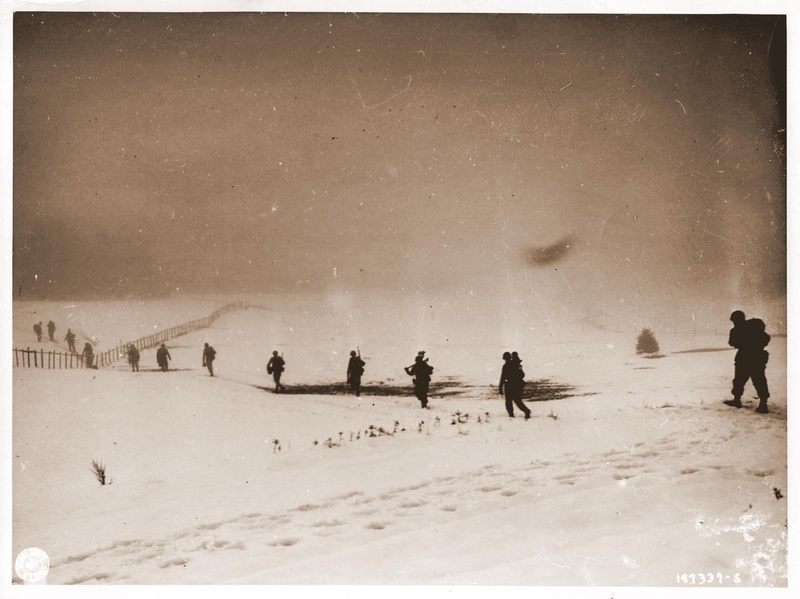 The 22nd Battalion was asked in help but the tanks couldn’t reach First Battalion because of mines and snow. At 16h30, the First Battalion was holding up by machine gun and mortar fires coming from Germans entrenched approximately seven hundred meters south of the objective. The Regimental journal mentions the German soldiers were entrenched along the stream called « Rau de Fazône », east of Compogne (US coordinates 567668) and opened fire at the moment when US soldiers leaved the woods “Les Acins". The day fell slowly and at 17h30 men received order to consolidate their position for the night. The attack would start again the next day. During the night the two Task Forces organized patrols toward the « Vaux » river to found passageway for the next day. Men of the Task Force Bell explored the area north of the Compogne-Mabompré road while men of the Task Force Bell explored the south area of the above road. Six men died that day (see table VI). Table VI: listing of the 193rd Regiment me died on January 15, 1945. Tuesday January 16, 1945. During the night the whole CCA area passed under control of the 193rd Regiment. The Second Battalion returned under command of its regiment and the regiment under the control of the 17th Airborne Division. The initial aim of the First Battalion was reached early in the morning and twenty prisoners were captured. 101st Airborne and 11th Armored Division reports indicate the German troops in the area were 26th Infantry Division, 9th Panzer Division, 130th Panzer Division plus Engineer Headquarter. The Task Force Stubbs command post arrived at Compogne around 11h30. This other photo extracted from "TALON with the 17th in Ardennes" shows the entrance of the village of Compogne (TFH collection). It seems that Company HQII (and may be the whole 2nd battalion) was trucked out of Compogne to the vicinity of Mabompré. When they came under fire, the trucks turned around and the men had to walk the rest of the way. They marched toward Houffalize and took high ground by 17h00. Three GI’s died that day (see table VII). Table VII: listing of the 193rd Regiment men died on January 16, 1945. Wednesday January 17, 1945. After ten days of battle the 507th Parachute Infantry Regiment relieved the regiment. It entered in the village of Mabompré where it stayed as divisional reserve until January 20. The men used these three days to rest, clean and maintain the weapons. Three GI’s died on January 17 (see table VIII). Table VII: listing of the 193rd Regiment men died on January 17, 1945. Sunday January 21, 1945. The regiment made movement toward a new assembling area located in woods southwest of Tavigny. It may be the woods called « Les Haies » that are the only woods in this area. Monday January 22, 1945. The regiment was sent to another assembling area less than one kilometer from the Great Duchy of Luxembourg borders, approximately one kilometer southeast of Limerlé (US coordinates 7173) . At 08h00 an advance party composed with headquarters members of the different part of the regiment starting making movement. At 11h00 a command post settled temporarily at Rouvroy farm. At 13h09 the Second Battalion received an emergency march order. It left its position at 14h00. When it arrived in the area it occupied woods on the northeast of the position. First Battalion followed and took position north of the same woods. At 15h00 the regimental command post set up in Halt north of the same woods. First Battalion. One company of the 811th Tank Destroyer Battalion (M18 Hellcat tanks) was in support of the Second Battalion. The 257th Field Artillery Battalion (155mm Howitzer) ensured regimental artillery support. Sergeant James R Rhoads was carried away on a stretcher with frozen feet. Tuesday January 23, 1945. 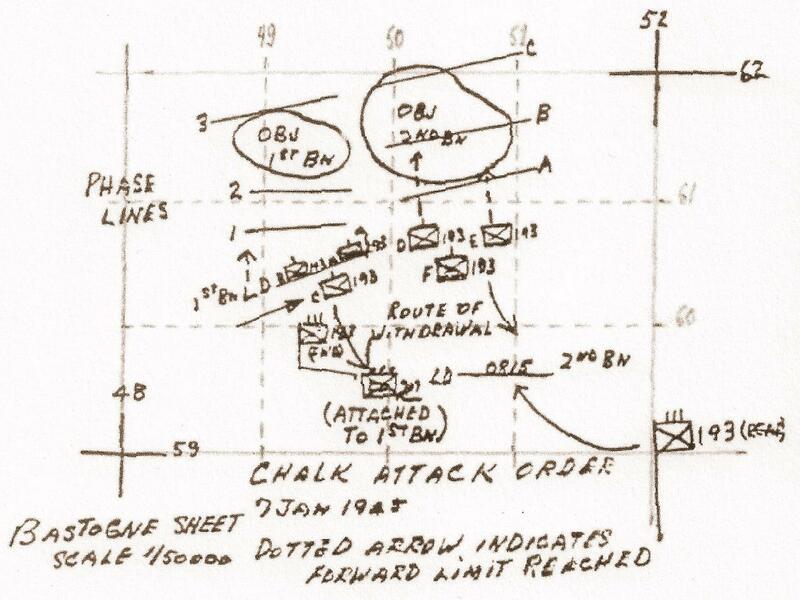 At 05h30 two patrols composed of six men of the Reconnaissance and Information Section plus two radio operators were organized and commanded by Lieutenant Piper and Mullett. They were sent in front of the Second Battalion to explore Hautbellain. They met resistance on the east and northeast of the village but at 07h10 Lieutenant Mullett informed he was in the village. Meanwhile artillery fires fell south of his position he explored the place and forty minutes later he sent another message to notify Germans had left the position the day before at 22h00. So the position was empty but Germans were entrenched around the village. The principal part of the attack started at 08h30. The progression followed a ride that started from the previous position passing through woods north to the « Baraque Dumont » toward the road east of Hautbellain (I am not completely sure of that). At 10h00 when Company E arrived on the top of hills east of Hautbellain it received instantaneously intensive artillery fire. A counter battery fire was ordered. Advanced Regimental Command Post moved towards the buildings of the “Baraque Dumont” during the day. At 11h25 the Second Battalion received order to send one company to definitively clean the village. It was so that at 14h00 Company D entered in the village and started its mission. However Company E stayed in support on the hills east of the village. Company F was in reserve during the operations. Unceasing artillery fires fell on the village. There were guided by German observers located on the hills two thousand meters east of the hamlet. At 16h30 a patrol from Company D caught ten Germans prisoners north of Hautbellain (US coordinates 747751) and ten others southeast of Wattermal (US coordinates 750760). During the day First Battalion was in regimental reserve and received order of moving toward woods located a thousand meters west of Hautbellain, astride the Hautbellain-Limerlé road (US coordinates 7274) and stay in reserve (I think it is in the headquarter area). It seems there was a French unit on the left flank but I haven’t found any information about this. Since 18h00 it organized patrols toward Huldange. The French soldiers found that approximately one hundred and fifty German soldiers held the small market town, the road between Hautbellain and the village was trapped and bridges (US coordinates 748744 and 752745) were destroyed. They captured nine prisoners southwest of Huldange (US coordinates 765749). At 18h30 the regiment received divisional order to move toward the woods northeast of the village (I think these are the woods located astride the border between Belgium and Great Duchy of Luxembourg, east of Wattermal). This order was rapidly canceled and the regiment entrenched on its positions during the night. A lot of patrols were sent in the Germans lines to localize strong points and capture prisoners. “ We moved out in the morning and after a long walk attacked Hautbellain. The mortars were set up in a house at the edge of town with the rest of the town down in a valley. The house was masonry with a corrugated shed attached to the house. The mortars were behind the house. The Germans would walk their fire up the road and one blast was near the house and penetrated the shed killing Hawkins and wounding Youngblut. The house next door was hit and burned to the ground. I was up all night keeping contact between the mortars and CP.”. Wednesday January 24, 1945. Patrols from the Second Battalion captured other German prisoners northeast of Hautbellain in the morning (US coordinates 749752). At 12h15 the regiment received a new attack order against woods northeast of the village just on the borderline east of Wattermal. The Second Battalion received the mission to start the attack. It sent a strong patrol organized by Company E toward the aim. First Battalion stayed in regimental reserve and must follow the Second Battalion. At 13h00 the head patrol received artillery and mortar fires even though it was south of the objective. At 14h10 it saw approximately twenty German soldiers who ran through the northeast woods. At 15h00 the Second Battalion started its advance toward the aim. It was directly hit by artillery and sniper fires but reached finally its objective establishing contact with the First Battalion, 513th Parachute Infantry Regiment, which came from the north. An advanced post was established on the north edge of the woods just on the borderline (US coordinates 779773 and 779760). At 16h15 the regiment was hit by error by friend artillery. When night came, the First Battalion moved, and took position on the southwest flank of the woods (US coordinates 761761) however regimental command post occupied the northwest edge of woods (US coordinates 761766). The vehicles movement was very difficult because of snow and mines. At 17h45 the regiment received orders for the next day. It was to support 194th Glider Infantry Regiment in its attack toward Huldange from 08h00 on. I haven’t found losses during that day in the official casualty listing but in the accumulated records I have found one man killed in action, a man wounded and twelve men evacuated in the Second Battalion. I don’t know so the exact situation. Thursday January 25, 1945 is the official date of the end of the battle of the Bulge. The regiment then entered in the Rhineland Campaign. At 10h00, the division was relieved from its position and advance command post was established at Eschweiler. The men of Company HQII (and probably the entire 2nd Battalion) moved during the day, at noon they marched to another woods where the Germans dug deep and large enough for an entire squad in one hole with a stove and log roof. After digging gun emplacements, they having chow, and were ready to settle down for the night. At 23h00 they moved out several miles to another woods. Eugene Herrmann (Co HQII) got sick as a dog and just made it to the next stop. There was no loss on that day. 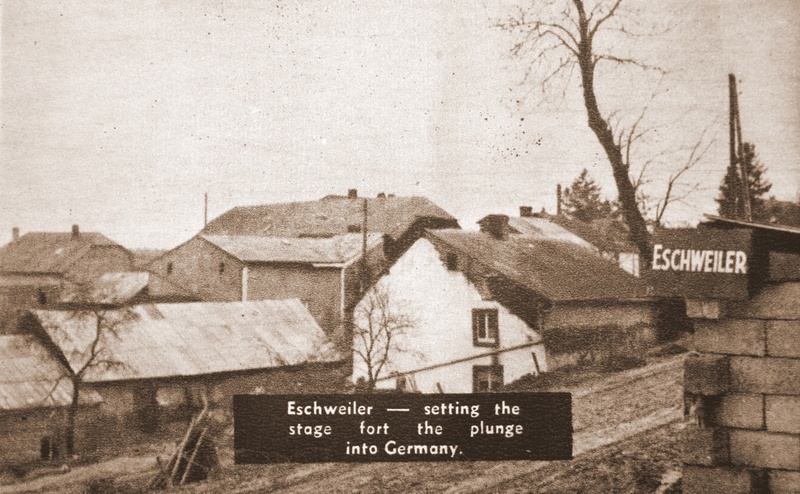 The village of Eschweiler during winter 1944-45 (TFH collection). It is probably William P Cianci, Warrant Officer Junior Grade in the HQ and HQ Co. In his book “War stories” Bart Hagerman mentions an interview between Colonel Marshall (official historian of the American army) and officers of the unit (Colonel Stubbs and Lieutenant Colonel Schorr, Ashworth and Balish). Marshall reports that the command post moved near Mande-Saint-Etienne at 07h45, the places seem little bit different. I haven’t more information concerning the good localization of the advance command post but I think it was localized in the village of Mande-Saint-Etienne (the place of Monti had only two farms). It is in fact south-east. It is Platoon Sergeant Mardell A Kreuzer. It is certainly the right flank platoon (I do not know exactly which one of the three) that was literally swept (approximately twenty to thirty men). It is possible that this incident was located more early in the morning. For Donald the advance took again around 13h00. It seems it is too early. In the official report we found Company F was engaged at 14h35. It is however a good estimation so long years after. Private Bailey had realized earlier in the morning another heroic action when he rescued, with the help of Sergeant P Jacobs Jr from Regimental Headquarters Company and Private William M Hall from Communication Section, a wounded comrade fallen in open field. I don’t know the exact position of the first line at this time. It contained certainly the above woods and the woods on the left side of the Hemroulle-Champs road (face to Rolley castle). 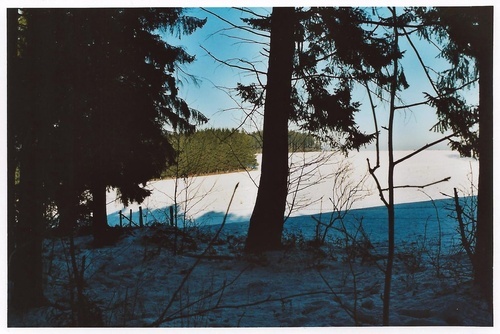 It is possible the woods located in the open field at 800 meters of the crossroad between Mande-Saint-Etienne, Flamisoul and Champs were part of the first line. On basis of the study of US airplane’s photos it is demonstrated there were also positions in the fields. I am not sure of that because, according with the accumulated records, Champs was in German hands at that time. It is possibly Hemroulle. If this fact is confirmed, it seems that men of the Second Battalion joined their attack position during the night. May be it is Thomas J Finneran and Alfred C Lehman. It was a wooded area in 1945. It is now an open field. I don’t know the exact date of the liberation of Bertogne but the men crossed “Au Caillou” corner on January 13 and this corner is very closed to Bertogne! There is also a problem concerning the exact positions of the Second Battalion. Is it came from the “Nondefalize” woods before the attack of Bertogne and returned after in the previous position? Came they from another position? Stayed they in the village? All that facts are not clear. This order of battle is reported in the accumulated records of the 193rd Glider Infantry Regiment and is different from those found in the book “War Stories”. In this book, B.Hagerman gives this order of battle: 41st Cavalry Reconnaissance Squadron, 11th Armored Division; 55th Armored Infantry Battalion; 492nd Armored Field Artillery Battalion; Company C, 811th Tank Destroyer Battalion; Medium Company of 42nd Tank Battalion (commanded by Lieutenant Colonel Joseph Aeheb); Medical Company of the 22nd Tank Battalion and the First Battalion of the 193rd Glider Infantry Regiment. It is probably the N826 road. PJ Rice cites the « Bois aux 3 Chênes » woods but I can’t locate them. This is confirmed by PJ Rice that writes “it was Baraque Dumont” approximately 1 miles south of Limerlé and just east or rail road track”.